Keen Betty Boots - Snow bunny meets snow Betty in KEEN’s Betty Boot II. The essential winter boot features a technical outsole for advanced traction in slick, wintery weather. Features:• Weight: 16 oz/454 g.• Type: Insulated, Snow Boots, Waterproof.• Fit Tip: We find this style runs about a 1/2 size small.• Lining: Moisture wicking textile.• Upper: Abrasion resistant textile, Waterproof nubuck.• Rubber: Non-marking rubber outsole. *Measurement Note: Our measurements were taken using a Women’s size 7 US (37.5 EU). 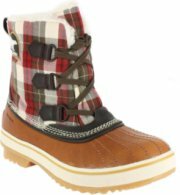 Sorel Tivoli Boots - Colorful and rugged durability is what you will find in these Women's Tivoli Plaid Boots. The waterproof shell is lined with 100 grams of Thinsulate and a full fleece lining for insulation you can count on in cold weather. Built for the cold, the blend of a lightweight urban shoe with the warmth and protection of an original Sorel snow boot. The result redefines functional cold-weather fashion. Full-length fleece liningWaterproof shell and material upperMolded rubber outsole for excellent tractionRemovable EVA footbed. Sorel Joan of Arctic Boots - The Sorel Youth Joan of Arctic Boots offer the perfect blend of protection and style for young feet. Waterproof suede uppers are seam-sealed for extra protection. Boots are insulated with removable 9mm washable, recycled felt and faux-fur snow cuffs. Midsoles are constructed of reliable 2.5mm bonded-felt frost plug. Outsoles boast handcrafted waterproof, vulcanized-rubber shells with a herringbone pattern. Imported. Ht: 10". Avg. wt: 21.3 oz./pair. Kids' whole sizes: 1-4 medium width. Keen Bern Baby Bern Boot - The KEEN Bern Baby Bern Boot makes you feel comfortable wherever you roam. This women's boot features a water-resistant leather upper with a medial side zip and decorative buckles. The polyurethane midsole and polyurethane outsole of the KEEN Bern Baby Bern Boot offer support and traction. KEEN. CUSH is a blend of recycled PU, cork and memory foam that contours to feet and adjusts to give you the cushioning you need throughout your day. Keen Toyah - The Women's Toyah Shoe by Keen. Feminine lace-up style on the top; tough, no-nonsense KEEN outsole underneath. Ready for whatever urban adventure life can dish out, the Toyah offers practical style in a shoe comfortable enough to keep you smiling through a day on your feet. The oiled nubuck leather upper features accented top stitching and classic KEEN toe protection, while a comfy anatomical footbed and active outsole provide support. FEATURES of the Keen Women's Toyah Shoe. Vans Authentic Lo Pro - The Authentic Lo Pro Shoe from Vans is a delicate and feminine version of of the vans classic. The Vans Authentic Lo Pro offers a low profile silhouette, for a contemporary shoe with a classic Vans look. The Authenic Lo Pro is equipped with Vans' micro waffle bottom outsoles for traction and grip that functions like Van's traditional skate shoe. Water Based Inks and Glues. Sorel Tofino Boot - This sleek and sophisticated boot features waterproof construction and a waxed canvas upper combine to keep feet cozy, protected and warm in cold winter conditions. Features:• Waterproof construction.• Waxed canvas upper with leather overlays.• Leather shell.• Weight: 21.3 oz / 604 g.• Shaft Height: 12.75 in / 32.5 cm.• Sorel rated: -25° fahrenheit / -32° Celsius.• Imported. Fabric:• UPPER Waxed canvas, leather.• SHELL Leather. 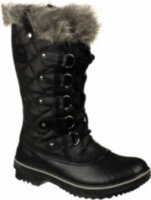 Sorel Caribou - SOREL CARIBOU - WOMEN'SThe original and best. Since 1972, the Sorel Caribou earned its reputation for warmth, durability and comfort the hard way: by protecting the feet of millions of Sorel customers through deep snow, harsh storms and the biting cold of long winters. Rated to -40° below zero, the Caribou is the timeless choice for work and play in cold weather. The nubuck leather upper and handcrafted vulcanized rubber shell are seam-sealed for complete waterproofness and lined with a removable 9mm ThermoPlus™ felt InnerBoot that traps heat next to your foot, where it belongs. Columbia Sportswear Bugaboot Plus II Omni-Heat - You're not afraid of monsters, asteroids, or tofu, so why would you be terrified by something as easily tamed as winter? Answer: you wouldn't be, not when you've got the Columbia Bugaboot Plus II Omni-Heat Boot blocking out the wet and the cold as you tromp through the frozen wasteland. Using a waterproof leather upper to seal out any moisture that crosses your path, the Bugaboot is a true winter workhorse, with a high-traction Omni-Grip rubber outsole that doesn't care how slick the terrain is, even if you're running uphill on a buttered skating rink. 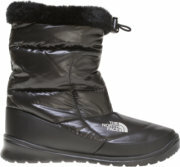 The North Face Greenland Zip II - The North Face Women's Greenland Zip II Boot. Built specifically for women, a waterproof, insulated mid-calf boot designed to withstand the wettest conditions and temperatures down to -40° F. FEATURES of The North Face Women's Greenland Zip II Boot. 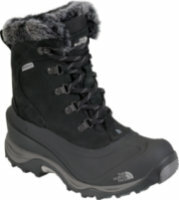 SPECIFICATIONS of The North Face Women's Greenland Zip II Boot. Fully lined with Dri-Lex® fleeceLatex seam-sealed constructionDriLex fleece lining adds extra warmthWaterproof construction for the ultimate weather protectionAustralian shearling sheepskin collarCompression-molded EVA midsole cushions every stepNorthotic dual-density footbed features a firmer arch and softer pads under the forefoot and heel400g PrimaLoft Eco insulationThermal-efficient H.
Steve Madden Troopa - Enjoy a vintage vibe with the Steve Madden Troopa lace-up boot. The supple leather upper of this women's casual boot combines handsome stitching details and a distressed look with a full inside zip entry for easy on-and-off. A lightly cushioned footbed and smooth leather lining lend the Steve Madden Troopa ankle boot durable stability and all-day comfort. Leather lining. Leather upper with classic stitch detail. Lightly cushioned leather footbed. Side-zip closure with lace-up front. The North Face McMurdo II - Will it ever stop snowing? For the umpteenth time this season you drag yourself out of bed, grab the snow shovel, and head outdoors to clear the driveway. 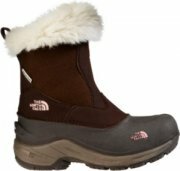 At least you invested in The North Face Women's McMurdo II Boot, so while your back and fingers may be complaining, your feet are toasty and warm. The McMurdo's impregnable TPR is shell topped with waterproof nubuck leather to create a barrier against snow, slush, and water, while 400g Heatseeker Eco insulation keeps your feet warm in temperatures down to -40 degrees. 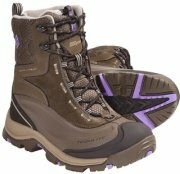 Merrell Whiteout 8 Waterproof - Tired of winter boots that just don't perform? Look again. The Whiteout 8 has all the technical features you are used to finding in a men's boot, but made for a women's foot and style. 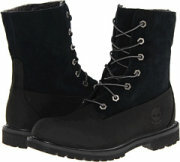 Waterproof throughout with reinforcement around the lower half for added durability and an 8" cuff to keep the wet out. Synthetic insulation with a faux fur lining and silver reflective film on the insole to keep the coldest part of your body warm during long excursions out. Swedish Hasbeens Chelsea Debutant - The Chelsea Debutant comes in sizes slightly larger than normal and the brand recommends ordering one full size down. Satiate your splendid desires with the simple sweetness of the Swedish Hasbeens® Chelsea Debutant! Natural grain leather upper. Slip-on style with goring panels and a pull tab at back. Perforated detail. Capped round toe. Leather lining. Lightly padded insole. Natural wooden platform and heel. Rubber outsole. Made in Romania and Imported.. Keen Toyah MJ - The Keen Women’s Toyah MJ Shoe combines style and comfort with its fashionable design and supportive construction. The Toyah features a waterproof nubuck upper to handle anything from rain to spilled coffee, and a removable EVA footbed for arch support and cushioning. The adjustable instep strap creates a feminine look you can wear to the office or to the pub, while the rubber outsole provides durable traction. Lightly padded heel collar for added comfort. Timberland Authentics Teddy Fleece Fold-Down - Add outdoor style with waterproof protection to your seasonal wardrobe with the Timberland® Authentics Teddy Fleece Fold-Down boot. Premium full grain, waterproof leather and suede upper. Soft suede shaft allows for easy roll-top styling. Durable laces with Taslan® nylon fibers and rustproof hardware. Teddy fleece lining ensures an abrasion-free environment for all-day wear. The waterproof membrane helps keep feet dry and comfortable for protection in any weather. EVA midsole for added comfort. Tretorn Langta Rubber Rain Boot - Wide Calf - Meaning yearn in Swedish, the Längta from Tretorn make these the perfect rubber boots you've been wanting all along!Textile lining and insole for a comfortable in-shoe feel. Buckle closure for optimum fit. Flexible and durable rubber outsole. Resilient rubber upper makes this the ideal boot for snowstorms, rainstorms, or anything in between.. Keen Harvest MJ - FEATURES of the Keen Women's Harvest MJ Shoe. SPECIFICATIONS of the Keen Women's Harvest MJ Shoe. Available in woven rice bag or repurposed fabric scrap upperUpper consists of woven reclaimed rice paper for added durability. Care for Reclaimed Rice Paper/Brown Paper: Lightly hand wash with mild soap and soft towel. Wipe clean with a dry towel. Do not machine wash. Recycled PU and cork footbed with natural canvas cover creates eco-friendly comfort. Ugg Classic Tall - The women's UGG® Classic Tall boot is one of UGG's most iconic silhouettes. UGG's popular Classic Tall features genuine Twinface sheepskin and UGG's signature UGG® woven label. Have fun with your style and wear this tall boot uncuffed up or cuffed down exposing the shearling. All boots in UGG's Classic Collection feature a soft foam insole covered with genuine sheepskin and have a light and flexible molded EVA outsole designed for amazing comfort with every step. Fitzwell Tempe Boot - Classic, chic and easy to wear!Synthetic lining. Elastic band at top line for a great fit. Cushioned insole features the signature Fitzwell gel comfort heel pad. Full side-zip closure. Smooth leather upper. Textured man-made sole. Stacked moderate heel. Dainty button accent..
Sorel Tofino Cate Boots - Faux fur lends a plush feel to these slim Sorel boots, styled with a quilted, waxed canvas upper and a leather-covered, waterproof shell. Cozy low-pile sherpa lines the interior, and bold rings detail the lace-up closure. Rubber lug sole. Leather: Cowhide. Imported, Vietnam. This item cannot be gift-boxed. MEASUREMENTSHeel: 0.5in / 12mm. Shaft: 11in / 28cm. Circumference: 15in / 38cm. 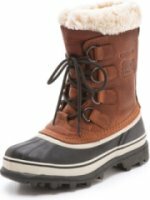 Sorel rated: -25° F / -32° C.
The North Face Shellista Lace - Fully insulated and waterproof, The North Face Women’s Shellista Lace Mid is a first choice winter boot for town and country. Its sturdy leather and nylon upper is fully seam-sealed for protection from the snow and moisture. PrimaLoft Eco insulation adds generous layers of warmth to defend the foot from the cold. Great traction on hard or slick ground comes from the TNF Winter Grip rubber compound outsole, incorporating IcePick lugs harden in low temperatures and bite into the terrain. The North Face Nuptse Fur IV Boot - The North Face’s Nuptse Fur IV Boot might look like a fancy fashion accessory, but with its 600-fill down insulation, DWR weather protection, and WinterGrip rubber outsole, this boot definitely packs in plenty of function with all that style. Cut-and-buff EVA midsoleNorthotic footbed cradles your foot and provides cushioning and comfortDWR fabric coating protects the down insulation from moisture600-Fill down insulation keeps your feet toasty warm without adding extra weight and bulk100% recycled P.